Rainbow Rowell, author of my favorite heart-stuttering tales of first love Eleanor & Park and Fangirl, conquers tepid marriage in Landline. Well not so much “conquers” as “casually approaches and throws up her arms in semi-defeat.” Because while a love story comes with a prepackaged resolution—a kiss and confession of mutual desire—a story about a couple with two kids, married for 15 years, not necessarily in love, more so in shambles doesn’t really have a resolution. Sure, the embittered husband and wife can close the book with a kiss and a re-confession of mutual desire, but that’s no promise that the conflict of the 300 previous pages has been definitively surpassed. It’s probably just lying in wait around the next bend. 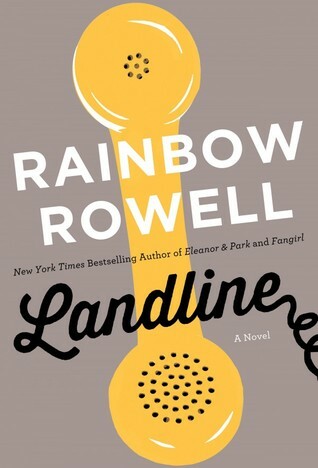 So what I’m saying is Rainbow Rowell has decided to attack an altogether different subject in Landline. It’s still a talky romance but it’s not romantic. It’s a harsh and measured look into sputtering relationships, into what happens post-happily ever after. I didn’t like it as much as Rowell’s YA novels, and superficially, I must admit that it’s partially due to the lack of will-they-or-won’t-they-please-please-will-they?? flirtation that accompanies two young people falling in love. But although I may appreciate it less, Rowell is no less wise when it comes to describing two older people falling in and out of love on a day-to-day basis. She has some truly fantastic musings on love and marriage, ideas that young’uns like me, people nowhere near slipping a ring on their left hand finger, might be reluctant to accept. She suggests that love is sometimes not enough, that two people can adore each other to the end of time but they will never be happy if they try to stay together. Rowell says things that her teenage characters Eleanor and Park and Cath and Levi might scoff at upon hearing but then anxiously turn over again and again in their heads at night before falling asleep. These are truths feared by the young and gained only by maturity. What I liked less is the gimmick that moves the plot forward. After skipping Christmas with her husband’s family in Nebraska to work, Georgie feels like her marriage might be over until she finds a magic phone that calls her husband Neal in the past. This unrealistic device is incongruous next to the realistic portrait of marriage. It’s also unnecessary. If Rowell wanted Georgie to compare her present relationship to her past relationship, she could have accomplished this merely by making Georgie reflect and remember. In general, the novel feels somewhat rushed, like it could have been constructed with more care and an eye on deleting superfluous scenes. Selfishly, I want Rainbow Rowell to return to the realm of YA so I can watch two young kids kiss and confess mutual desire, i.e., fall in love. But she definitely has the skill to write about broken relationships and the (im)possibility of their repair—next time, however, she’ll hopefully do this with one less magic phone.